The two poems in this particular book are quite different, although both capture Hughes' focus of Harlem, NY, as a teeming community of life, energy and hope. In the first poem, MOTHER TO SON, a working mother chides her son to keep pushing himself for a better life through education, reminding him that "Life for me ain't been no crystal stair." And the mother forcefully tells him: "So boy, don't you turn back!" The other poem, HARLEM NIGHT SONG, is of a different tenor altogether as Hughes seeks to capture the energy, music and vitality of Harlem, repeating the refrain "I love you" throughout the stanzas. 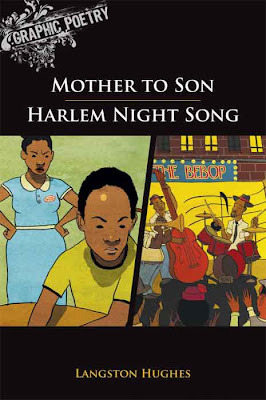 The artwork here by Martin Wittfoot is a nice match to the poetry of Langston Hughes, alternating between the serious and emotional voice in MOTHER TO SON and the playfulness with HARLEM NIGHT SONG. We see the pain of life and hardship on the mother's face as she talks to her son in the first and the reader is brought up on a rooftop tour of buildings in Harlem in the second. The images are colorful and meaningful. This book is designed for the classroom and it has more than just the graphic poems here. The editors have thoughtfully included the two poems on their own, too, so that the reader can experience the poem as a graphic reading and by itself. The back of this book also has an overview of Langston Hughes' style of poetry and expands into his use of diction and tone for MOTHER TO SON, even pointing to pages to show examples of these terms. Finally, there are a few follow-up activities for the reader, focusing the attention on the writing of a poem (suggesting the reader write a poem back to their own mother, for example). There is also a wonderful biography of Langston Hughes. Taken together, this one small book provides an entry into the world of Langston Hughes on many levels. This book is highly appropriate for students in elementary through high school classrooms, particularly as an introduction to Langston Hughes. I would highly recommend this book for any classroom poetry collection. There is no profanity or violence in this poetry book. Thank you for sharing this resource. The ability to introduce poetry in this way, seems like a great way to get graphic novels more widely used in my classroom.